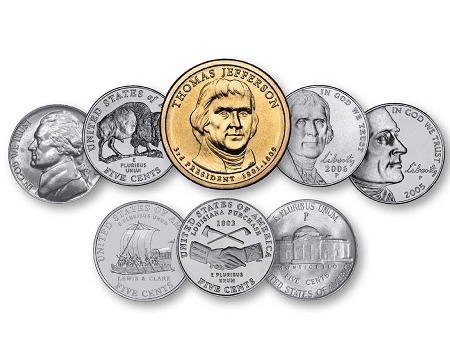 Thomas Jefferson Legacy Coin Collection! Never to Be Minted Again! 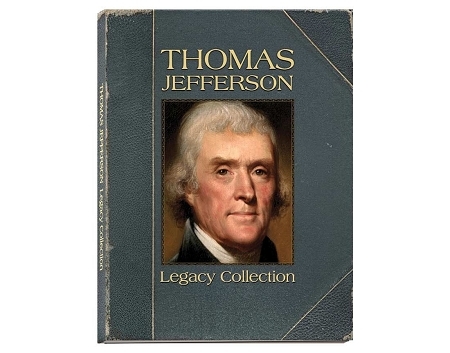 New in 2011, this set features 8 coins from the man who authored the Declaration of Independence. We've surrounded an uncirculated 2007 presidential $1 coin with 7 historically significant coins all featuring Thomas Jefferson. All of the coins are beautifully showcased in a legacy tri-fold filled with historical events and details from Jefferson's life. Included in the set: - The Wartime Nickel (1942-1945) - The Jefferson Nickel (1938-2003) - The Peace Nickel (2004) - The Keelboat Nickel (2004) - The Bison Nickel (2005) - The Ocean in View Nickel (2005) - The Return to Monticello Nickel (2006-present) - The Thomas Jefferson $1 Coin (2007) Also includes a parchment copy of the Declaration of Independence. Beginners Set! $1 1957 Silver Certificate, $2 2003 FRN, $1 1976 Bicentennial Ike Dollar, $1 Eagle Design Ike Dollar Coin!